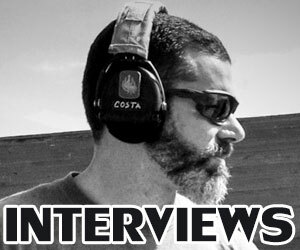 So to help give you the information needed to choose the right extension for your needs, Vitaly and I are working to bring you a series of in-depth reviews of extension kits for the Remington 870. For this first entry, I chose to review the Remington factory +2, one of the most popular and widespread extensions for the 870, and one with which I happen to have years of hands-on experience. The factory Remington +2 and +3 870 extensions are old designs, dating back at least as far as the 1960s. Initially developed for use on military and law-enforcement 870s, these extensions remain some of the most popular 870 extensions today for soldiers, officers, and civilians alike. 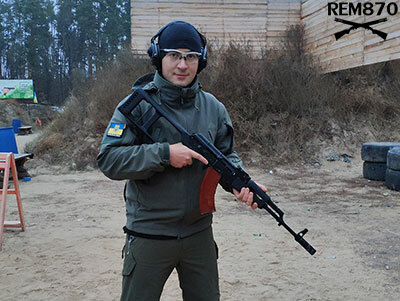 The kits by themselves are widely available, and are also factory-installed on many Police, Tactical, and Special Purpose 870 models. The Remington extension coupling is just under .73” long, with external ridges that provide a good grip during installation and removal. The rim at its base is about 1.4 inches in diameter, which may interfere with extra-heavy 1”-diameter slug barrels, but should fit without a problem on pretty much anything else. Its base has rectangular notches that engage the magazine cap detent on barrels that have them. The coupling is fully-threaded inside with female threads that match those of both the receiver’s magazine tube and the extension tube. The magazine extension tube has a standard 1” outer diameter, making it compatible with a wide variety of clamp-on accessories. Its front end features a stepped-down, permanently-attached cap that is slightly over half an inch long and 7/8” in diameter. 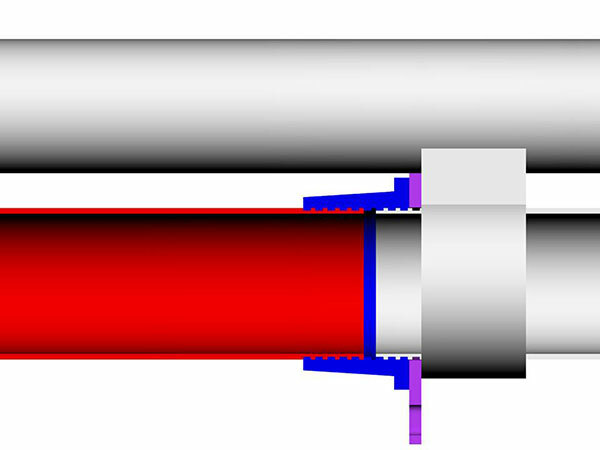 In the center of the end cap is a vent hole that allows air to move in and out of the tube to reduce pressure drag, provides a point where any water (or other liquids) that may have made its way into the magazine can quickly and easily drain out, and allows a dowel or rod to be inserted to control and align the magazine spring during assembly and disassembly. Alternatively, this hole can be plugged with a sling stud or a simple button-head cap screw. The reduced-diameter end cap is a feature that speaks to the original military application of these extensions. 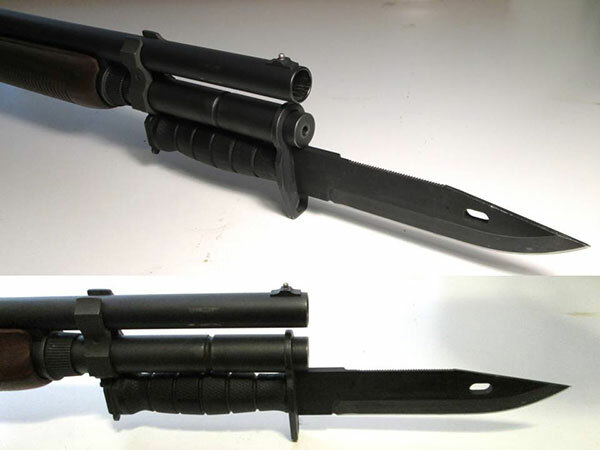 The 7/8” diameter matches the mounting rings of standard M16 bayonets, and older military 870s were equipped with reinforcing brackets that provided the rear lug for these bayonets. At the base of the magazine extension tube is about .45” of thread, which leads to a bit of a shortcoming. Since the extension tube can only thread .45” into the coupling, the magazine tube has to make up the other .28” of thread, or else a gap will be left inside the tube (be aware that these measurements are for the specific extension parts I have on-hand; thread length is subject to some variance, so you may see slightly different numbers with your particular kit). 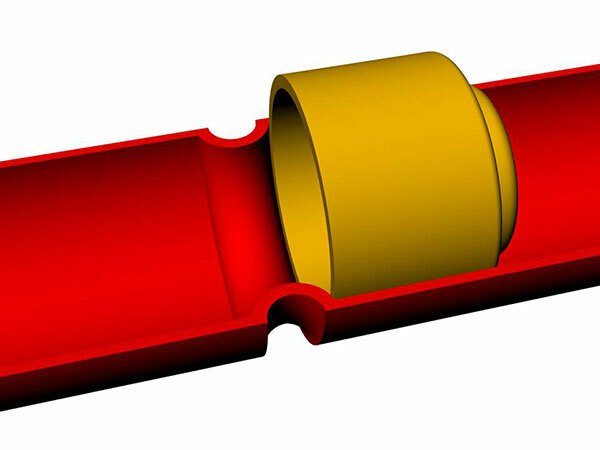 This is not a problem for most barrels & receivers if the coupling is installed directly against the barrel guide ring, but if something like a sling plate is placed between the guide ring and coupling, or if this extension is installed on an 870 clone with less exposed thread than a genuine 870, the extension tube may not be able to thread in far enough to compensate. An extra quarter-inch of thread on the extension would have gone a long way toward allowing the extension to maintain a good internal mate when used with under-cap accessories or clones. As it is, I would recommend skipping under-cap sling attachment points, rails, or light mounts, and sticking with clamp-on alternatives when using this extension. Removing the first couple thread turns from the forward end of the coupling can allow the extension tube some extra travel, but this is a rather advanced modification that will be outside the comfort zone of most 870 owners (although replacement couplings are not terribly expensive if you screw yours up). The extension tube is around 6 7/16” in total length, meaning its end will line up with the muzzle of an 18.5” barrel, and extend about a half-inch past the muzzle of an 18” barrel. Though some may find this undesirable for aesthetic reasons, it will not cause any functional problems, and is actually an intentional design feature relating to its bayonet mounting function. 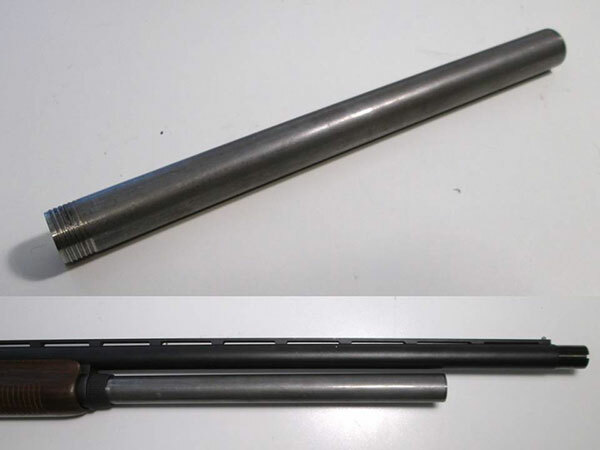 The half-inch of extra length keeps the bayonet’s hilt in front of the muzzles of 18” barrels (the Remington +3 extension tubes similarly extend a half-inch past the muzzle of 20” barrels). 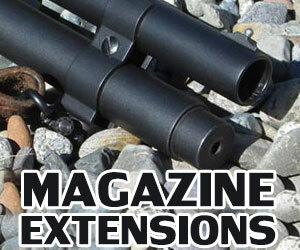 As is typical of two-piece magazine extensions, a reinforcing bracket should be used to secure the extension tube. 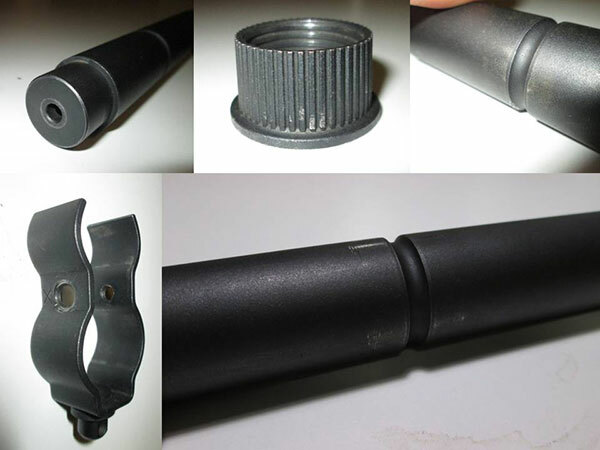 If it is not locked down, the extension tube will quickly work loose under recoil, leading to unreliable function. Thankfully, a bracket is included in Remington extension kits. Not quite as large or complex as the original military brackets, these modern .75”-wide brackets are of basic yet functional all-steel construction, and some feature a standard sling swivel stud at the 6-o’clock position (more detail on that later on). The bracket is clamped to the barrel and extension by a single screw, so you will need a screwdriver or multitool on-hand to be able to take the gun down. I always have a Leatherman on my belt, so this isn’t a big deal for me, but it’s something to keep in mind. You can install the bracket with the screw head facing either left or right – whichever meets your preferences or works best with the rest of your build. The screw is intentionally low-set, and passes through a groove in the extension tube located about 2.5” back from its front end. Once installed, this groove positively and securely locks the bracket in place against recoil, impacts, and sling forces. The exposed screw can cause minor cosmetic wear to the edge of the groove with heavy use or repeated removal and reinstallation, but I for one would take a little cosmetic wear over clamp movement any day. The downside to this security is that the bracket can only be installed at this groove. 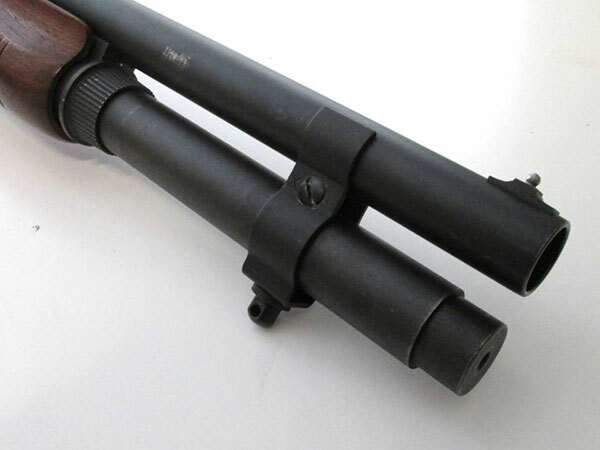 This might limit your options for other barrel- or tube-mounted accessories, prevents you from using this bracket with most other extensions, and means you can’t use it on any barrel with a muzzle more than about two inches back from the end of the installed extension (extended choke tubes don’t count). 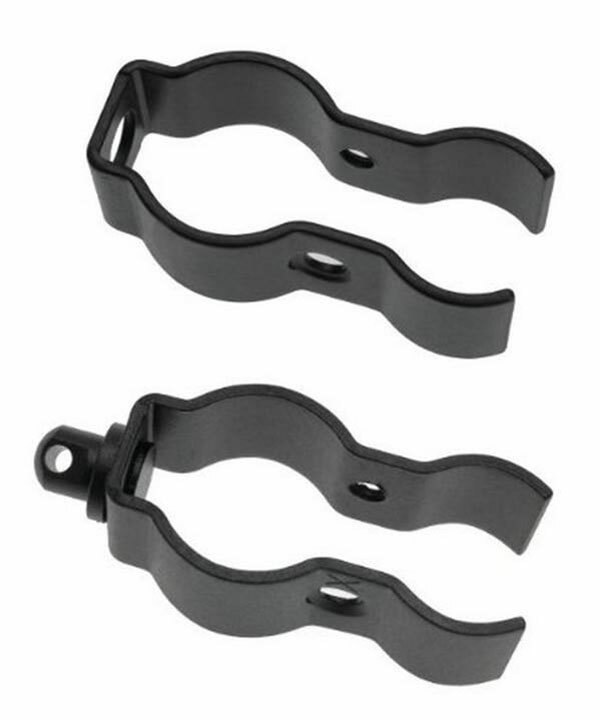 Another potential issue is that these brackets are designed for standard barrels with a normal outer diameter and spacing (center-to-center distance between the barrel & magazine tube). 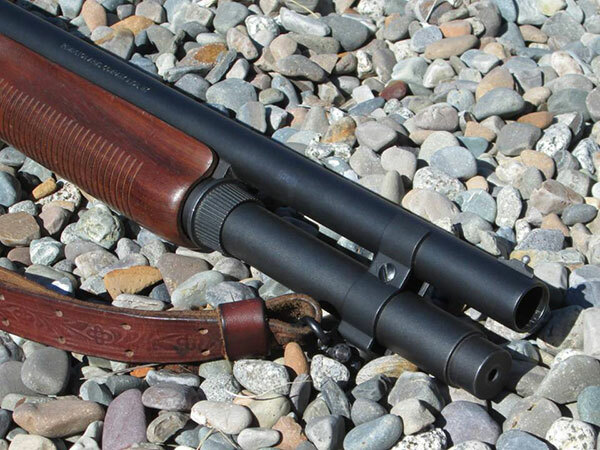 I have an older Wingmaster barrel that has a lighter profile and a slightly higher spacing, and when I try to use my bracket to secure Remington extensions to it, the extension tube is pulled up out of alignment, usually resulting in unreliable function. I’ve been told that Remington makes (or perhaps used to make) brackets intended for these taller barrels, but I’m not sure on the details. 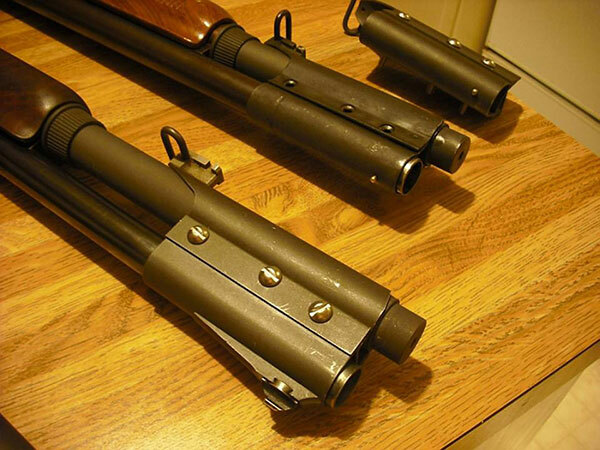 If you have a heavy-profile barrel, you’ll probably need something aftermarket or custom-made. The groove that accommodates the bracket’s mounting screw has a second purpose. It creates a constriction inside the extension tube that results in a hard maximum follower travel of about 3.9 inches. After adding the 12.125 inches of space in a standard 4-round base magazine tube (this measurement will be different for 870s or 870 clones with nonstandard magazine tubes) and subtracting the length of a factory magazine follower, there’s only about 15.3 – 15.4 inches of space available for shells (depending on how the front of the follower fits into the crimp of the foremost shell). This is enough space to fit six of any SAAMI-compliant 2.75” shells (which would conform to a maximum crimped length of 2.45 inches), but capacity will be limited to five rounds with 3” shells and out-of-spec 2.75” shells crimped longer than 2.55” or so. Capacity may even fall to four rounds with some longer-crimped 3.5” super magnum shells. It should also be pointed out that a follower stop makes capacity directly dependent on the length of the magazine follower’s body (although follower tails should be able pass through the constriction without affecting capacity). The above numbers were measured and/or calculated assuming that the factory Remington follower takes up .7” of space; if you’re planning on using an aftermarket follower with a different body length, you’ll need to take that into account. Many other +2 magazine extensions have enough internal space to accommodate 3” magnums, and careful spring and follower selection can free up extra room for longer magnums or even allow an additional 2.75” shell to be loaded. Not so with the Remington +2, and this may be an undesirable characteristic for some users. However, there are some positive trade-offs to this limitation. In magazine configurations without follower stops, the magazine spring can become over-compressed during loading if the user loses count and tries to jam in one round too many. This over-compression can shorten the life of the spring and even cause jams if the coils overlap enough to hang up on each other. By stopping the follower at a predetermined point before the spring can be over-compressed, a follower stop can provide more reliable function and extend the life of the spring. These are clearly the priorities of the Remington +2 extension, which was designed to hold the 2.75” combat loads used by military and law enforcement organizations. Capacity with 3” hunting magnums was pretty much irrelevant in those applications; from what I’ve heard, the early combat 870s that first used these extensions only had 2.75” chambers anyway. If you really want 6+1 capacity with 3” magnum shells, the Remington +2 isn’t for you. But for competition, combat, or defensive applications where 2.75” short-magnum loads are the most powerful thing you’ll realistically need, this extension’s capacity is sufficient, and the benefits of the follower stop have definite value. Remington offers +2 magazine extensions in a variety of finishes that will match most 870s in their current lineup. Complete extension kits are offered with either a Parkerized finish, or polished bluing that matches blued Police & Wingmaster shotguns. Remington also finishes +2 extension parts in a matte black oxide for 870 Expresses and some Special Purpose models, electroless nickel plating for Marine Magnums, and their proprietary extreme-conditions black TriNyte coating for the 870 XCS (though XCS parts may not be in current production). Remington’s 2014 catalog does not list complete extension kits with these finishes, but the individual parts are listed on their website and in their parts documentation. The +2 magazine extension reviewed here came factory-installed on an 870 Express, so it has the matte black oxide finish. This finish is a bit basic, and while it protects the underlying metal reasonably well if kept oiled, it is not as effective as higher-end finishes and is prone to rubbing off under the bracket or other metal clamp-on accessories (though it touches up nicely with a little cold blue). If you’re looking at installing one of these extensions your 870 Express, and you’re not too worried about having an exact visual match, I would recommend ordering the Parkerized kit rather than piecing together a matte black oxide version. The Parkerizing is still a fairly close match to the Express finish, and seems to resist wear and hold oil better than the budget-level black oxide. Under the finish though, all extension parts are exactly the same, and so long as you don’t mind the look, there’s no harm in mixing & matching differently-finished parts to come up with a complete extension. 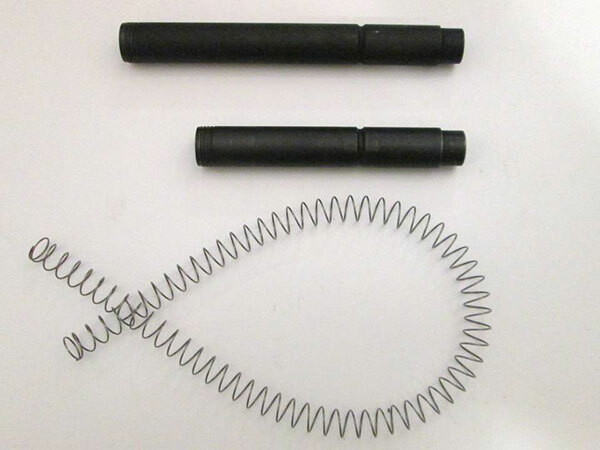 An interesting fact about the Remington +2 extension spring is that it’s actually the same spring as the one used in Remington +3 kits (Remington does make a special spring for use in the Marine Magnum & XCS +2 extensions, but I wasn’t able to obtain one at the time of this writing to see if it is also sized for use in +3s). 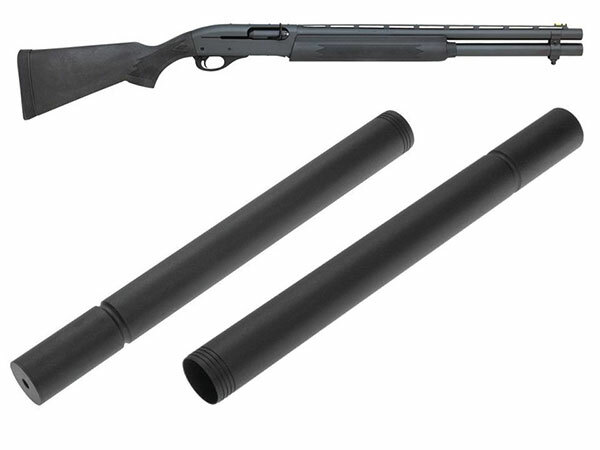 The original 870R Riot Grade and 870 Mk 1 military shotguns had 20-inch barrels, and (at least in the latter case) +3 extensions. Parts commonality being favorable for both cost-effective manufacturing and military logistics, Remington engineered their +2 and +3 extension tubes with the clamp groove/follower stop the same distance back from the extension’s front end so that they could both use the same springs and bayonet mounts. I’ve had my Remington +2 magazine extension tube as long as I’ve had my 870, and though the magazine spring is still working fine, I decided to order a new one so that I could evaluate the spring in both well-used and out-of-the-box conditions. The new replacement spring was somewhat stiffer and longer than my original one, which is to be expected when comparing a brand new spring to one that’s seen years of use, but there were some additional differences such as a more matte appearance and an extra coil or two on the newer spring that suggest that these are not exactly the same part. Both are simple constant-diameter springs with squared ends and relatively narrow diameters to allow them to fit into cup-style followers and pass through the constrictions of the extension tube’s follower stop and bayonet end cap with minimal resistance. With outer diameters measured at .665” for the old and .670” for the new, these springs should have no problems fitting into most cup-style followers, but they also have enough space inside for typical tailed followers. You can use aftermarket springs in these extensions, but be aware that wider springs may have trouble moving smoothly past the follower stop. 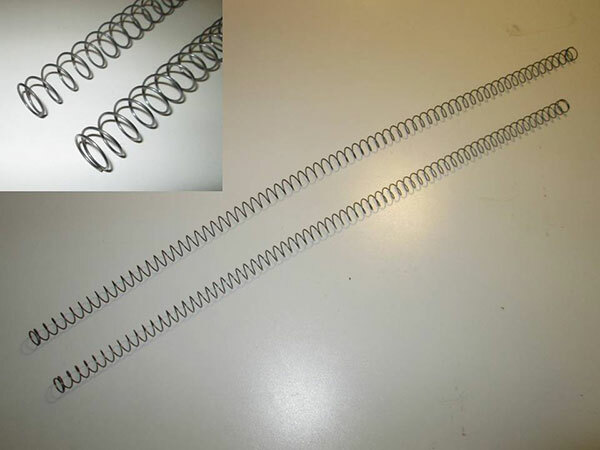 The used spring had a relaxed length of 25.25”, and the new spring measured in at 28.25” when fresh out of its packaging. It’s hard to say how much of that dissimilarity is due to wear and how much is due to differences in the coil count & pitch between the two springs. I did note that after being compressed to its solid length several times, the new spring’s relaxed length was reduced to about 28” even. The actual wire diameter of the two springs was about the same though, and both had solid lengths of right around 3” (without forcing the coils to overlap) for solid length ratios (relaxed length/solid length) of about 8.4 and 9.3 for the used and new, respectively. This is fairly low compared to other magazine springs, which can have ratios of 15 to 25 or more. With the follower stop dictating the extension’s total capacity, this low compressibility isn’t really an issue, but I wouldn’t recommend using these springs in magazines that don’t have follower stops. To test the strength of the spring, I installed my Remington +2 extension on a spare magazine tube, and used a scale to measure the “empty force”, or the force exerted by the spring with the follower just inside the end of the magazine tube (as it would be in an unloaded shotgun). 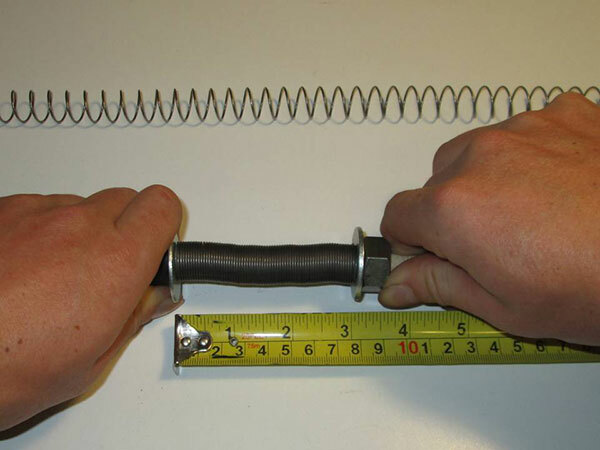 This is the metric I use to compare spring force in different magazine configurations and evaluate whether or not the spring is strong enough to feed reliably, as problems with weak springs tend to first appear when feeding the final shell from the magazine. With the factory cup-style follower, the used spring produced an empty force of 2.375 pounds, and the new one exerted a force of 3 pounds. This should be plenty of force to ensure reliable function – it’s even a bit on the stiff side. Trimming the spring is an option here, but unless you’re really put off by a stiff spring, I’d leave it be. For the heavy-use combat applications the Remington extension kits are designed for, a little extra spring force is not necessarily a bad thing. In addition, the long spring allows you to add a +3 extension tube to your standard 870 or use the +2 on 870 clones with 5-round base magazine tubes without having to buy a different spring. 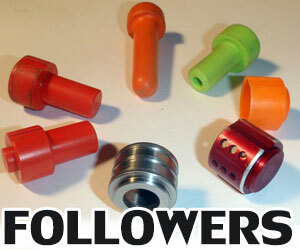 Unlike many aftermarket magazine extension tube kits, The Remington kits don’t come with new followers. 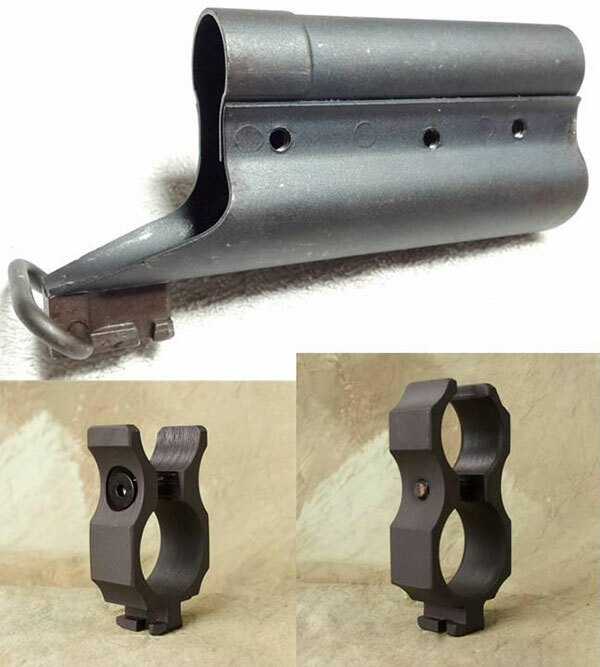 They are intended to be used with the cup-style factory magazine followers that are installed in all 870s, including 870s that are factory-equipped with a magazine extension or extended magazine tube. The current-production blaze-orange factory polymer followers are lightweight, high-visibility, inexpensive, and are a good match for the Remington +2 and +3 extensions. 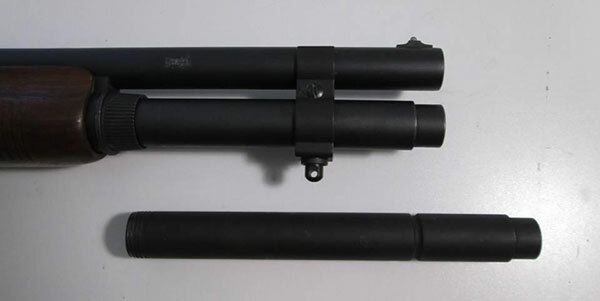 Older factory followers have been made of stamped steel or non-high-visibility polymer, but share the basic design, and should work equally well in these extensions. Though for just $4.12, you may want to consider upgrading to the current-production high-visibility part as an extra safety feature. Folks like to call these polymer followers cheap or unreliable, but I’ve tested several different followers in the Remington +2 extension, and out of all of them – including a very high-priced machined stainless steel follower – the “cheap” factory part proved to be the most reliable and trouble-free. There are countless heavily-used police and military 870s out there that are running these same exact followers with no problems at all. If you do want to replace the factory follower though, I would recommend sticking with cup-style followers, as they provide more space for the spring when the follower is against the follower stop. Forcing a solid-bodied follower against the stop will tend to over-compress an untrimmed Remington extension spring, forcing the coils to overlap and potentially hang up on each other. 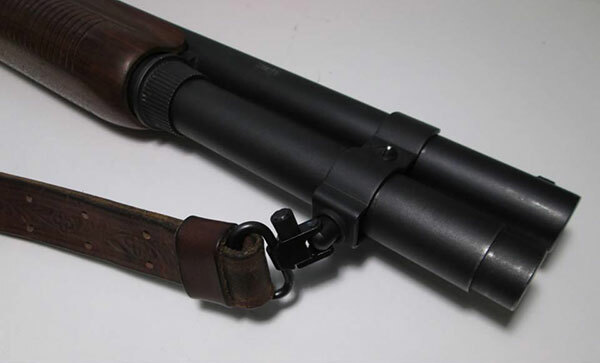 To enable the use of a sling, Remington magazine extension brackets have a squared-off section at the bottom with a hole through which a sling stud can be mounted with a separate collar and snap ring. This stud can rotate freely, so it won’t bind up or damage itself if the sling is twisted. And with the bracket locked into the groove in the extension tube, it’ll stay in place no matter how hard you jerk the sling around. However, the stud’s attachment to the bracket is a little on the loose side. This doesn’t cause any functional problems or affect its strength, but the stud does have a tendency to rattle, and the free-spinning can lead to twists in slings that have a lot of slack. And because the bracket can only be installed in one place on the extension, you’ll have limited options if it interferes with some other accessory you want to install. The stud (with or without a sling attached) could also potentially provide an improved handhold for an attacker who managed to grab the end of your gun. If you just want to secure the extension, and you don’t need to be able to attach a sling, the stud will come off if you can get the snap ring out. This will make the bracket lower-profile and rattle-free. These brackets can also be ordered separately without a stud installed, though they still have the hole to accept one if you order the parts. If you want both, I’d suggest ordering one of each type rather than trying to remove & reinstall the stud for different applications, as the snap ring that holds it all together is not very easy to get to. Combined, the Remington +2 coupling, extension tube, spring, and bracket (with sling stud) weigh in at about 7.7 ounces total. Assuming you’re replacing a typical magazine cap, 4-round spring, and spring retainer, expect this extension to add something in the neighborhood of 5.75 ounces to the unloaded weight of your gun. This figure can vary somewhat depending on the specific spring, retainer, and cap you’re replacing, whether or not your bracket has a sling stud, and a handful of other variables. If you’re comparing this extension to single-piece alternatives that don’t come with brackets, note that the Remington extension bracket (the version with the sling stud, to be precise) counts for more than 1.7 ounces of this total figure. If you’re planning on installing other clamp-on accessories and leaving the factory extension bracket off, a Remington extension would only effectively count for about 6 ounces total. This makes the Remington +2 fairly light for an all-steel extension kit; coming in an ounce or more below other steel +2 kits I’ve examined even with its bracket. It’s not a huge difference, but if you have to pack your 870 long distances or hold a home intruder at gunpoint for an extended period of time while waiting for the authorities to arrive, you’ll appreciate even minor weight savings – especially when that weight is located out at the muzzle end. When ordered directly from Remington, complete extension kits are priced at about $90 – $120, and ordering the individual parts (as you would need to for certain finishes) will cost about the same (2014 pricing). This is a bit on the steep side, considering that there are a number of alternative aftermarket extensions in the $50 – $60 neighborhood. Fortunately, complete blued or Parkerized +2 kits or the equivalent individual parts in other finishes can often be found from 3rd-party sellers or online auctions & for-sale listings in the $45 – $70 dollar range, so these extensions are fairly competitively-priced, you just have to be willing to shop around. As mentioned earlier, the Remington factory +2 & +3 870 extension kits share the same couplings, brackets, and even springs. This means that if you have a complete Remington +2 kit, the only item you’ll need to buy to also have a Remington +3 is the +3 extension tube (or the +2 extension tube if you already have the full +3 kit). Additional +2 & +3 extension tubes can be ordered from Remington’s parts department for $27.81 each at the time of this writing (some special versions or finishes may be more expensive). The +3 magazine extensions are virtually identical in design and construction to the +2 extensions in fact; the only difference is that the +3 extension tubes have an extra two inches or so of tube space between the tube’s open end and the bracket groove/follower stop. So if you want a review of the Remington +3, take this review, replace “+2” with “+3”, add two inches to the overall length and internal capacity numbers, and subtract roughly 5/8 of a pound from the spring forces. Remington also manufactures a +4 extension tube for a handful of competition/tactical Remington 1100 semi-auto shotguns, which reportedly installs using the same bracket and coupling as +2/+3 extensions for 870s, and is listed for the same price as +2 & +3 870 extension tubes. You will need a longer spring with the +4 however, and it has been reported that some minor modifications to the coupling may be required to let the extension tube thread in far enough to achieve a proper internal mate on an 870. But the options don’t stop there. 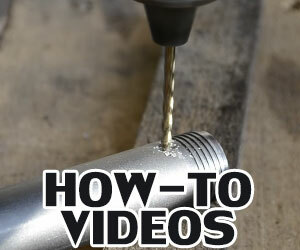 Since Remington extension tubes use the same thread as the base magazine tube, you can easily make your own custom-length extension tubes out of extra magazine tubes. Magazine tubes can be ordered in the bright from Remington’s parts department, or you can cut them off of donor receivers. Since they come with thread already machined into one end, all you have to do is trim them to whatever length you desire, add a cap of some kind, finish or paint them, and install them in any Remington extension coupling with an appropriate-length spring and a compatible clamp (though not the Remington extension bracket, since magazine tubes don’t have bracket grooves). If you’re clever, you can even build lights, lasers, or other gizmos into the ends of these. Another advantage here is that magazine tubes have a good deal more thread than Remington’s pre-made extension tubes, so even with a thick sling plate or other accessory under the coupling, these custom extension tubes should have no problem threading in far enough to mate properly. Another thing you can add to your Remington +2 or +3 extension is a clamp that provides a rear bayonet lug. This will allow you to mount any M16 bayonet – such as the US military M9 or M7 – on your 870. 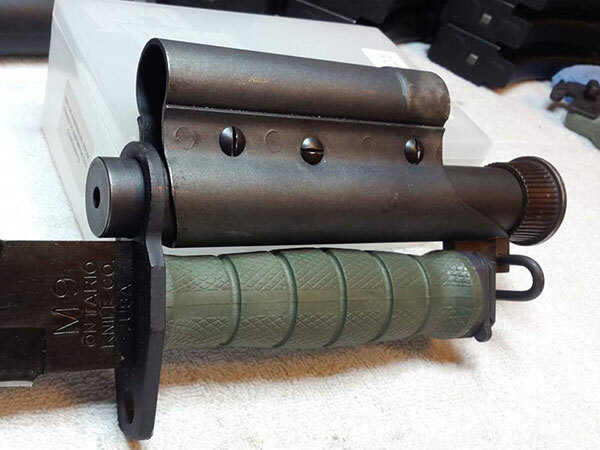 The original U.S. military clamps are expensive and difficult to find these days, but aftermarket alternatives are offered by S&J Hardware, and I’ve seen some other custom-made bayonet lugs pop up on auction sites from time to time. One thing to be aware of is that you can’t mount a bayonet on your extension with the extension bracket installed, as the bracket’s base and sling stud will interfere with the handle of the bayonet. The old military clamps incorporated a bayonet lug, sling ring, and usually a front sight into one unit, but the current S&J Hardware clamps only provide the bayonet lug. If you want to mount a bayonet and use a sling at the same time, you’ll need to find an alternate front sling mount. 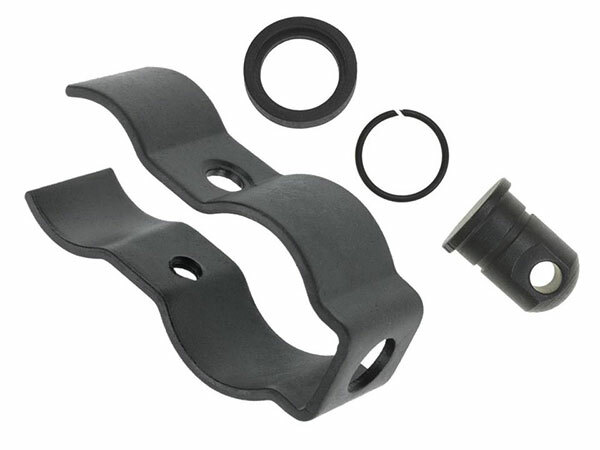 Before installing a Remington two-piece extension kit, you must first remove the gun’s magazine cap (or extension), spring retainer, magazine plug (if present), and magazine spring. If the gun has dimples in the magazine tube, these will have to be drilled or pressed out for the extension to have its full capacity. 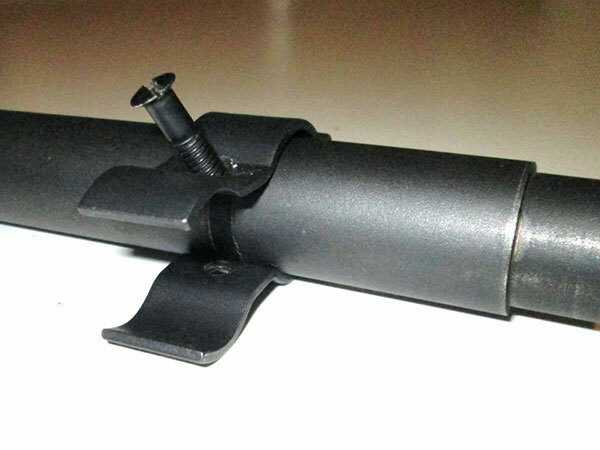 To install the extension, make sure the barrel is still seated in the receiver, and thread the extension coupling onto the magazine tube by itself, tightening it against the barrel guide ring as you would a magazine cap. Insert the magazine follower (if it isn’t already in the tube) and the extension spring through the coupling. Place the extension tube over the end of the spring and screw it into the coupling, making sure it can thread in far enough to tighten against the base magazine tube. If you’re having trouble controlling the spring, you can insert a thin rod through the end hole to keep it straight. Finally, slide the extension bracket over the barrel and magazine tube, line up its screw holes with the groove in the extension tube, and insert and tighten the screw. You can leave the bracket off if in an emergency, or if you’re just checking the fit or doing some non-firing testing, or you’re using some other add-on that secures the extension tube to the barrel. Otherwise, expect an unsecured extension tube to come loose under recoil in pretty short order. 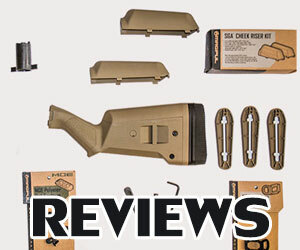 The function of any magazine extension revolves around its ability to reliably accept and feed shells, and the Remington factory extensions have a bit of a reputation for being finicky in this area. This is true to some extent; it’s not unusual for users to report hang-ups during feeding and loading with these extensions. 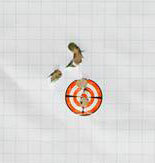 These tend to occur when trying to load the 6th round, or after feeding the first round, as this is the point where the follower is at the transition between the magazine tube and extension tube with typical 2.75” shells. For this reason, the follower tends to be the first thing to get blamed for malfunctions (often by the folks trying to sell you an expensive replacement follower). 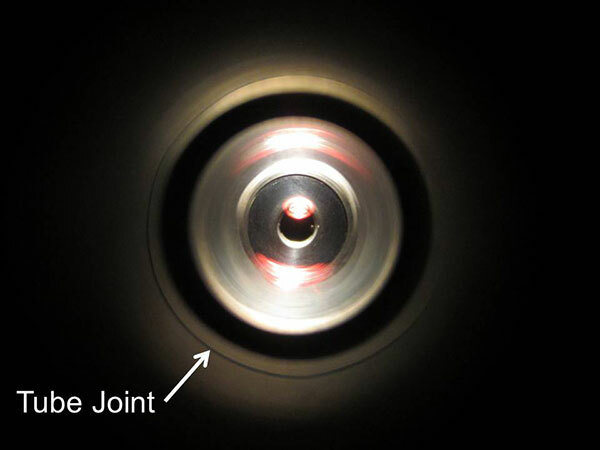 However, the follower can only hang up at this joint if there’s a gap or misalignment between the two tube sections for it to catch on; everywhere else, the interior of the extension tube is no different from the interior of the magazine tube. Changing the follower obviously won’t do a thing to fix a bad joint, and many aftermarket followers are actually more sensitive to internal tube discontinuities than the Remington factory follower. A poor internal mate can usually be traced to improper installation, such as trying to install the coupling and extension tube together, letting the extension tube come loose before installing the bracket, or not using a bracket at all. If the extension is installed properly, with the extension & magazine tubes properly aligned and butted against each other and secured against recoil, these loading and feeding issues are rare due to the nature of the two-piece design. If they do persist though, a little light sanding to take down any sharp corners in the mouths of the magazine and extension tubes and the leading edges of the follower should resolve things. I simulated a worst-case feeding and loading scenario by installing the Remington extension on my spare magazine tube, inserting the spring and follower, and pushing them down into the tube using a 7/8” wooden dowel with one end cut about ten degrees from square. When I used the dowel to move the follower back and forth across the interface between the magazine and extension tubes, the angled end jams the follower against one side of the magazine tube. This test is a harsh one that virtually guarantees some sort of hang-up will occur, the question is simply – how bad could it be? Well, in the case of the Remington extension with the factory follower, so long as the two tube sections had a good mate inside the coupling, I was only able to produce minor hang-ups – the follower would catch if I got it in just the right position, but a little extra force would push it through nearly every time. For such an extreme, absolute worst-case test, this is a very good result. Finally, function and reliability with proper installation means little if the extension will just work itself loose under recoil once you start shooting. Thankfully, in my years of shooting with Remington extensions, I’ve found them to be very solid, with the magazine cap detent securing the coupling and the bracket securing the extension tube. I do have one barrel that doesn’t have a detent in its guide ring, but if tightened down firmly, the bracket alone seems to do a pretty good job of keeping everything in place. I have seen the occasional report of these extensions working loose, but it’s hard to say how accurate or indicative those anecdotes are, as the extensions in those cases could have been damaged, defective, or improperly installed. Why is it that Shoten Armory and 3T Tactical have continually sent you write ups of our Magazine extensions only to have them ignored? James is it possible that your emails went to Vitaly’s spam file? Often times emails from manufacturers end up in people’s spam file because they get filtered out as unsolicited. I’m one of those guys who, when I want to do a project, I research the hell out of it. In this case, adding a mag extension to my 870. I’ve seen posted were people have used a socket to remove the factory installed detents and my thought was “Would you use a sledge hammer to tune your carburetor?” So, I shopped around and found “The Right Tool for the Right Job”. I read all the reviews and saw where some guys had a problem with the mag tube getting bent out of round and had an idea. I went to a Gunsmith and asked if she (yes, she) had an old mag tube cap lying around. She did, I gave her 5 bucks for it. I then took that cap to a machine shop and had them drill out the end of it. 10 bucks. I then took a Dremel and ground it down to just above the threads. This will take some time and patients. I screwed the modified cap in place and used the dent removal tool. Worked perfectly! The cap kept the tube in round. I showed this to a shooting group I belong to. They are lining up outside my garage to use this method. Not a bad idea. I’ll bet the coupling nut from these Remington factory extensions would also work well for that, and you wouldn’t have to spend the time with a Dremel. “If you can get the snap ring out.” How would one go about doing such a thing? You’d need some snap-ring pliers that are narrow enough to reach in there. I have an 870 Express with the dimples. If I bought a GG&G slotted follower, which they claim can be used without getting rid of the dimples, can I use a +1 mag extension? Would you trust that GG&G follower? Also, do +1 extensions still require brackets or basically function as big mag tube caps? +1 extensions mostly serve as a place for the spring to coil up into, as a standard 4-round 870 magazine tube has enough space for five typical 2.75″ shells and a typical follower. However, with the dimples there, you’re probably not going to be able to get five shells loaded before the follower hits the dimples. Or, if you’re lucky enough for the slots in the follower to line up with the just right with the dimples, you run the risk of the follower hanging up ahead of the dimples – thus effectively disabling the magazine entirely. If you want to run an extension, even a +1, you really ought to get rid of those dimples. Most +1 extensions are single-piece designs that don’t require brackets or clamps to stay together under recoil like this 2-piece design. You basically treat them like long mag caps, as you said.